The 1860 Waupaca County Wisconsin, Lind Township census shows the following record: J.F. Brown, 51 b. NY Marion O. 47 b. NY Jos. R., 25, b. PA John W., 21, b. PA Chancey B. 18, b. PA Judah, 16, b. PA Susan M., 13, b. PA Richard U., 11, b. PA Anna M., 9, b. PA Maud A., 6, b. WI If the age given for Judah in the census is correct, then his birth year was actually 1844 and not 1838 as listed in family records. The census also shows Richard, Anna and Maud as children, while no mention of them is given in family records, although there are children in the family records, not listed in the 1860 census. This could be attributed to the children being old eno ugh to have established families of their own, and being listed elsewhere in the census. 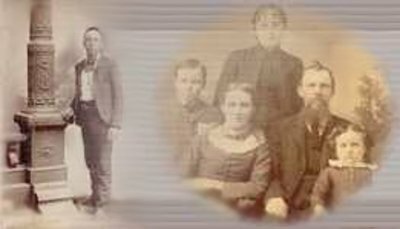 The 1870 Waupaca County Census shows for this family: John F. Brown, 61, b. NY Marien 57, b. NY Joseph R., 35, b. PA John W., 31, b. PA Richard L., 21, b. PA Anna, 19, b. PA Maud A., 16, b. WI The 1850 Erie County Pennsylvania, Greenfield Township shows Family Number 98: John F. Brown age 41, a Shoemaker, born in N.Y., Value of Real Estate: 400 Mariam age 37 Rittner age 15 Amy age 13 Wesley age 11 Polly age 9 Chauncey age 8 Judah age 6 Susan age 3 Henry age 1 The 1840 Greenfield Township Erie County PA Census shows this same family: John F. Brown age 30-40 Males under 5: 1 Males 5-10: 1 Males 30-40:1 Females under 5: 2 Females 20-30: 1 Noted immediately above this family in the 1840 census is a Judah Brown, aged 60-70 with a spouse of the same age having 1 male aged 5-10, and 2 males 20-30 in the household. [S4] Lind Grave Visits, (11/24/2004).